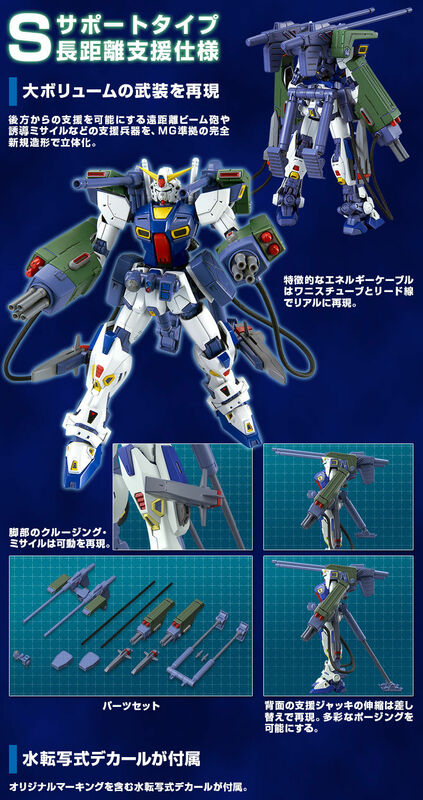 Jointly to "MG 1/100 Gundam F90" (sold separately), a mission pack capable of reproducing S type long distance support specifications and E type electronic warfare specifications comes up! 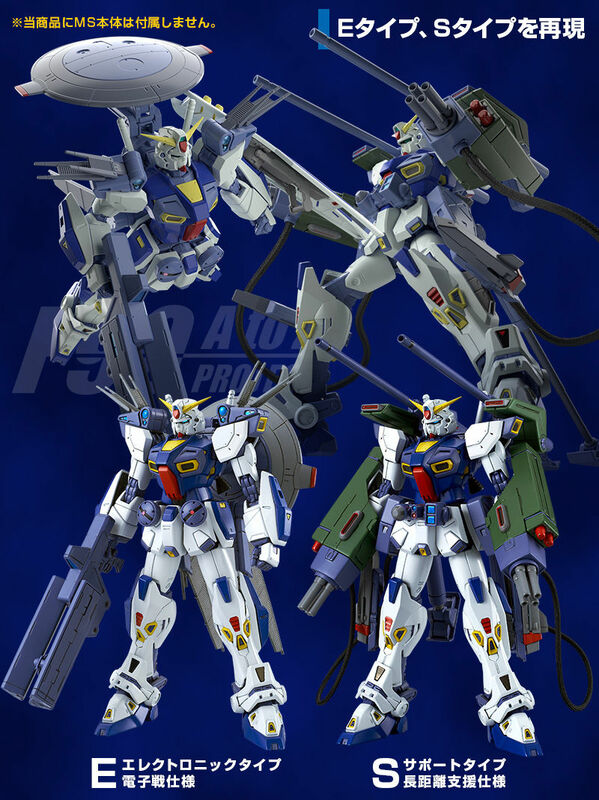 ※ This product and "MG 1/100 Gundam F90" (sold separately / premium bandai sales item) are required to reproduce the photos. 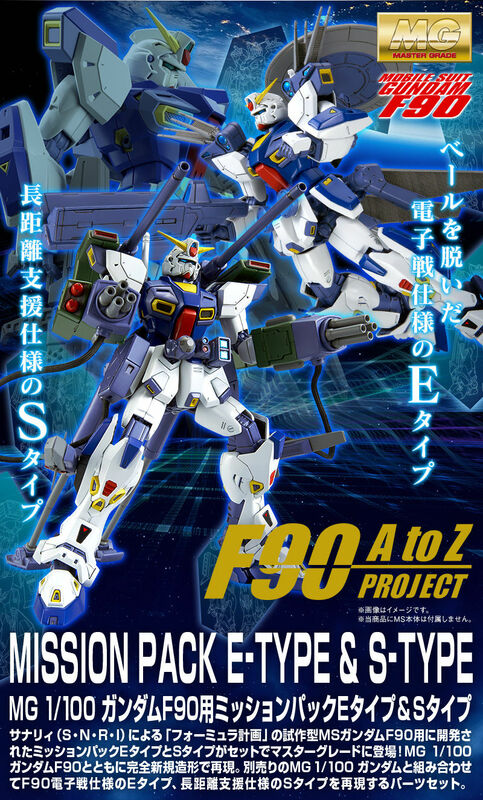 Mission pack, developed for San Francisco's "Formula Project" prototype MS Gundam F90, by S. N. R. I. 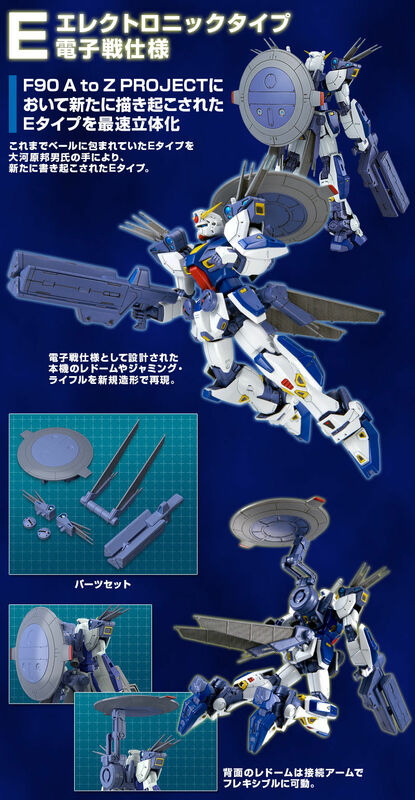 S type and E type appear in master grade by completely new modeling! Three-dimensionalization of the large volume arming of the long range weapon and the posture stabilization mechanism by new modeling. Long distance beam gun "Mega Beam Cannon"
The back option mounted long range beam cannon has a movable gimmick forward. "4 beam beam cannon" & "2 missile missile pod"
The two-armed cannon beam gun follows the settings and thoroughly reproduces the connection with the lumbar energy tank with the lead wire and the varnish tube. The leg mounted cruise missile can deploy the wing by gimmick and detach from the base. The rear waist support jack of the posture stabilization mechanism can reproduce the expansion and contraction state by replacing parts. Electronic battle specification equipment newly written up by Mr. Kunio Ogawara. Three-dimensionalizing each characteristic shape with new modeling. The back radome can be flexibly moved by the connecting arm parts. Newly shaped three-dimensional jamming rifle for electronic interference. Faithfully modeling additional equipment on the shoulders and back waist to the setting picture. Rear waist equipment can move up and down by gimmick. ● Water transfer decals are included. Water transfer decal including original marking is attached. ※ This product includes only "Mission pack E type & S type".